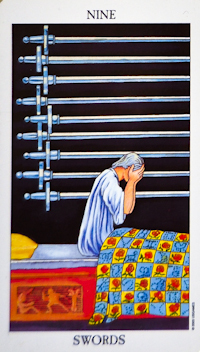 Nine Of Swords. Tarot. Free Tarot. Free Tarot Reading. The woman has an attitude of despair, regret, and contemplation. The coverlet which is marked with the signs of the zodiac and the seven planets symbolizes the experiences that life has brought her. These bring sorrow only if we allow them to impel us. If we understand that difficulties are lessons for growth and development, sorrow is lessened, and courage replaces frustration. The nine swords are pointing east, toward the light; this indicates new beginnings in the dawning new day.